WHO should read C. S. Lewis’ Space Trilogy? Homeschool high school students who are learning to be thinkers, creators and do-ers. Teens who are not afraid of big ideas and deep thinking. Young people who want to learn to be more imaginative and creative. AND anyone who enjoys the writings of C. S. Lewis! These truly are must-read books for people who want to wrestle with ideas or become culture-changers. These challenging, delightful, and sometimes terrifying stories wrestle with big theological concepts such as trusting God, challenging evil, and standing up for what is right. Teens will observe the negative effects of some modernisitic philosophies and the positive effects of good philosophic thinking. Deep thoughts set in wonderfully imaginative settings and marvelously unique stories abound! The study guide collection for high school students to use with C. S. Lewis’ Space Trilogy is a collection of 3 guides of learning that contains NO busywork – like all of our guides it offers important take-aways from each book. In Vicki Tillman’s C. S. Lewis Space Trilogy Study Guides for high school, homeschooling teens will gain experience in inferential skills and critical thinking. They will explore deep theological concepts. They will confront philosophies that Lewis believed are destructive. AND they will discover C.S. Lewis as a character in the books! 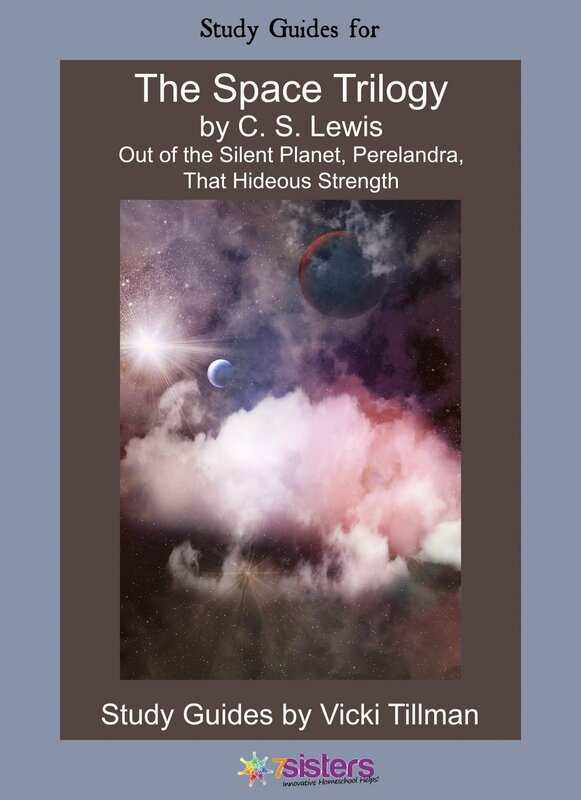 The C. S. Lewis Space Trilogy study guides for high school are adaptable with suggested activities for various high school levels (average high school, college prep, advanced, honors). Study guides to accompany each of the 3 books in the Space Trilogy may also be purchased for download individually for $3.99 each. For more Lewis learning, view the product description for The Chronicles of Narnia for High School here. To begin at the beginning with the Space Trilogy, click here for the product description for Out of the Silent Planet study guide.